From the outside, the Imperial transport vessel Pandora looked like any other frieghter. True, its engines and communications arrays seemed rather more advanced than those of most cargo ships, but this would only likely be noticed by those who cared to look. A closer examination might reveal unusual hatches that hinted at possible hidden weapons ports. A scanning would reveal only that the Pandora was largely unscannable—a product of the goatronium alloy shielding built into its hull. The Pandora, however, was not subject to the normal inspections. It carried no freight manifests. Although it docked at a dozen Imperial worlds, it left no records of its visits with the local authorities. Its crew were never seen in the usual dingy bars of the spacefarers’ quarters. None wore uniforms, but all had crewcuts and carried Imperial-issue sidearms. The Pandora was, you see, a “black ship” of the Imperial Science Division. It carried the scientists, supplies, and inventions of that secretive organization between its far-flung laboratories and research outposts. One day, however, something went wrong. Some say that the source of the problem was an unexpected solar flare that distorted the warp and disrupted Pandora’s extensive electronics. Others suggest a computer virus introduced into its systems by the covert forces of Chaos. Still others say that the Pandora was simply unlucky, encountering a heavily-armed Ork raider in an area of the Goatronium Expansions where no Orks ought to be. 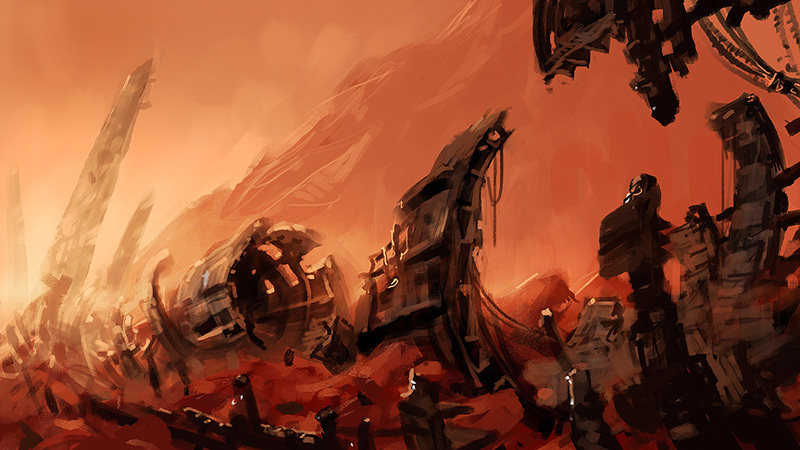 Be that as it may, it is known that the Pandora crashed on the derelict planet Neujoysi with the loss of all crew. Less than a day later, two rival forces—one Chaos, one Greenskin—arrived to scavenge the wreckage for valuable military secrets. Although neither knew exactly what the wreckage contained, both knew that it might reveal weapons powerful enough to tip the very military balance. 1,500 points, Orks vs CSM, largely urban terrain. The four major pieces of Pandora wreckage each counts as a regular objective. In addition, a six weapons crates will be randomly strewn around the battlefield. These also each count as an objective. Unlike a normal objectives, however, the crates can also be moved and opened. Infantry (including jump infantry) may take control of a crate simply by moving into contact with it, at which point it can move as the unit moves. Vehicles (as well bikes, jetbikes, skimmers, walkers) may take control of a crate by spending an entire turn in contact without doing anything else as the crew dismount and stows the crate. If a unit with a crate is destroyed, the crate remains in place—unless carried by a exploding vehicle, in which case the crate is destroyed. Crate is boobytrapped, and treated as exploding vehicle. Remove from play (no longer counts as an objective). Crate contains new advanced weapons sights. Unit holding the crate rerolls all misses. Crate contains special high power ammunition. Reroll wounds. Crate contains powerful stimdrugs intended to increase endurance and speed. Unit gains Fleet. Crate contains every possible kind of grenade (defensive, assault, and melta bombs).